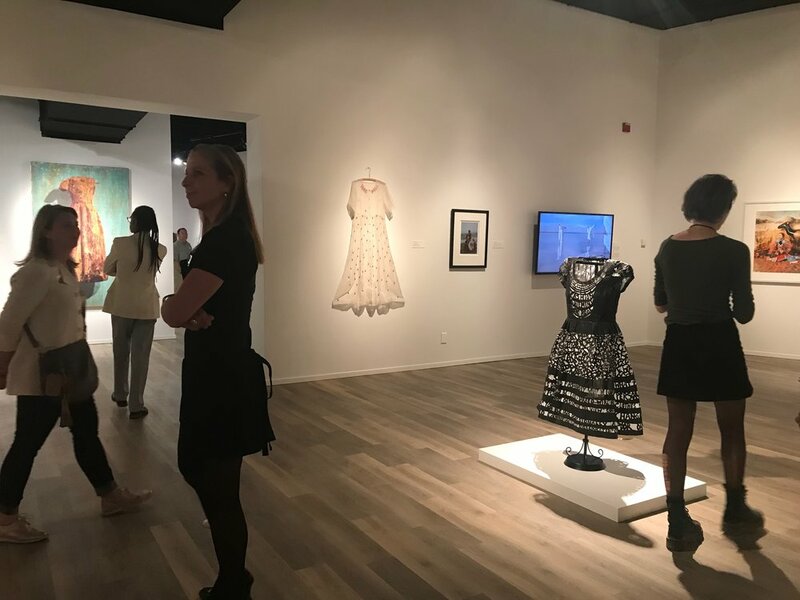 I'm honored to have my piece, "Drowning Dress" included in Dress Matters: Clothing As Metaphor at the Tucson Museum of Art in Arizona. The exhibition opened October 21, 2017 and it will continue through February 18, 2018. From the Tucson Museum of Art's website"
"Dress Matters: Clothing as Metaphor examines clothing in art as symbols of power and identity. At once functional and aesthetic, garments are worn to protect the body from the elements, enhance the beauty of the wearer, establish rank in society, and signal to others our differences or similarities. Garments also point to interpersonal issues and conditions as well as larger societal and cultural concerns. Works in this exhibition reveal how artists use concepts and images of clothing to relay compelling messages about gender, age, ethnicity, history, profession and the world around us in general. Dress Matters: Clothing as Metaphor is accompanied by a 64-page catalog, produced for the exhibition and published by the museum." Curated by Julie Sasse, Chief Curator of Modern and Contemporary art at the TMA, the show includes work from over 50 artists including Joseph Beuys, Willie Birch, Christian Boltanski, Nick Cave, Kate Daudy, Angela Ellsworth, Fausto Fernandez, Adam Fuss, Susan Jamison, Robert Mapplethorpe, Richard Mosse, Mark Newport, Catherine Opie, Wendy Red Star, Miriam Schapiro, and Andy Warhol. I was very fortunate to be able to travel to beautiful Tucson, Arizona for the very well attended opening of this exhibition. I met new artist friends who's work was also included in the exhibition and many lovely people who work at the museum. I was treated to a delicious dinner with a small group of museum staff, supporters, and artists at the museum's restaurant after the exhibition opening. Tucson is an convivial and welcoming city. It reminded me of a larger version of my hometown, Roanoke, Virginia. Tucson is also nestled in the mountains but it is surrounded by a stunning desert landscape. I enjoyed my stay at the new AC Hotel in downtown Tucson. From there I was able to walk to the Tucson Museum of Art, shops, restaurants, and nightlife. The AC Hotel has a gorgeous rooftop pool, a well appointed lobby with a little library of art and design books, and it's own bar and cafe. I chose to indulge in the more hearty breakfast served across the street at the Hotel Congress where the atmosphere is more animated and casual. I met new artist friends at the opening reception for Dress Matters and we all drove out to visit the Mission San Xavier del Bac which was established in the 1600's. Serendipitously, there was a car show taking place at the mission during our visit which created a striking contrast to the historic site. I'm hoping to have a reason to return to Tucson again soon. I owe a big thanks to Julie Sasse who curated my work into this exhibition and to supporters who made the trip possible for me. A lovely catalog was produced for the exhibition which includes all the artist's works and biographies. It is available through the Tucson Museum of Art. Ground Floor Gallery in Nashville, Tennessee is hosting Bared, an exhibiton curated by Sally Deskins which features the work of selected artists from the book of the same name, published in January 2017 by Les Femmes Folles. It explores the gendered narratives that clothe and fashion the body as well as gender subversion and the traditional male gaze. The exhibition runs from August 2 - September 2, 2017. The opening reception is Saturday August 5, 2017 from 6:00-9:00 pm. My painting "Lee's Lace", which was inspired by the work of the late fashion designer Alexander McQueen will be featured in the exhibition. Kathy Crabbe, Courtney Kenny Porto, Libby Rowe, Chuka Susan Chesney, Stacy Howe, Teresa Dunn, Cathy Sarkowsky, Bonnie Gloris, Rosemary Meza-DesPlas, KA Letts, Susan Detroy, Florine Desmothene, Evelyn Katz, Belgin Yucelen, Suzanne Proulx, Lauren Rinaldi, Amy Cerra, and Marlana Adele Vassar. Les Femmes Folles is a volunteer organization founded in 2011 with the mission to support and promote women in all forms, styles of art from around the world with the online journal, print annuals, exhibitions and events. LFF was created and is curated by Sally Deskins. LFF Books is a micro-feminist press that publishes 1-2 books per year by the creators of Les Femmes Folles including BARED: Contemporary Poetry & Art by Women, Edited by Laura Madeline Wiseman, 2017. Other titles include Les Femmes Folles: The Women 2011, 2012, 2013, 2014 and 2015. Artists, writers, and composers are you curious what to expect during a residency at the Virginia Center for the Creative Arts in Amherst, Virginia? Art lovers do you want to know what goes on during an artist residency? In July I spent fifteen days rewilding and working at the VCCA. This was my fourth time as an artist in residence at this lovely and peaceful place. There are typically around twenty-five visual artists, writers, and composers working here which creates an atmosphere of collective creative energy. In the studio barn, which was build in the 1930's, there are eleven writers studios including the funky little corn crib, nine 500-700 square foot visual artist studios, and three composer studios with baby grand pianos. There are two more writing studios in a cottage near the residence hall. All of the workspaces are private and assigned to individuals. I have worked in four different studios during my residencies here and they all had excellent natural light. The studios have work sinks, skylights, large tables, chairs, shelving, and little beds for napping or daydreaming. On this visit I worked for the first week in studio VA 2 then I was able to move into studio VA 7 which is the largest visual artist space at VCCA. One of the studios has an etching press and this space must be specifically requested. There is a don't knock policy in place for the studios but generally I have found that artists want to do a bit of show and tell at some point either for the whole group or informally at a time of their choosing. Map of the VCCA Studio Barn Complex. While at VCCA I started four new paintings in egg tempera that are based on crystal grid formations which are geometric arrangements of stones designed to raise energy for a specific intention. Usually they incorporate crystals, and natural objects. I'm adding butterflies, spiders, flowers, and my signature red threads to these meditational paintings. This is new subject matter for me and I'm not yet sure where these are headed but I'm enjoying painting objects that are just really beautiful. My work is very slow going but I made significant progress in a short time period due to the focus this place brings me. My set up for painting in egg tempera at VCCA. Three new 18"x18" paintings in progress at VCCA. All meals are prepared for the residents at VCCA eliminating the need to shop for groceries or spend valuable time cooking. Breakfast and dinner are served buffet style in the dining room of the residence building and lunch, (typically leftovers from dinner plus sandwich and limited salad items) is available in the kitchen of the studio barn. Vegetarian options are available. I suggest getting to the designated chow area on time for the best selection especially at lunch. I like to bring my own tea and keep it in my studio. If you like a special coffee or snacks bring them with you. There are electric kettles, coffee makers, and a microwave in the studio barn kitchen to boil water and a shared fridge to store your labeled food. The rooms in the dormitory style residence hall were recently painted and refreshed with new furnishings, carpeting, and sliding doors that lead to balconies or patios. The building still has a 1970's vibe. Most of the bedrooms have "Jack and Jill" style bathrooms which can be locked during use then unlocked for the benefit of your bathroom mate. This time I shared my facility with someone who locked me out continually but this is atypical behavior and it has never happened to me in past visits to VCCA. There is one bedroom available for couples and one that is wheelchair accessible. If you bring your own pillows, pillowcases, or towels I suggest you hide them come cleaning day lest they be thrown in with the communal linens laundry never to return to you. There are coin op washers and dryers to do laundry on the ground floor of the residence hall so bring quarters. Wifi is available in the residence hall and the studio barn but don't count on it for downloads or heavy streaming. The grounds of the VCCA are a mixture of both wild and more manicured spaces. There are huge old boxwoods, trees and shrubs as well as overgrown kudzu and un-mowed fields. There is a secret garden with a fish pond, a sculptural fountain contained within large boxwood hedges, a gazebo, hiking trails through the woods, and a small outdoor swimming pool. The cows and horses that were formerly on the grounds have gone. Now there are bunnies romping everywhere as well a wide variety of birds, the occasional black snake, opossums, skunks, and a rumored bear sighting. Two miles north on route 29 towards the town of Amherst is the campus of Sweet Briar College which has lovely grounds, hiking trails, a lake, a library, and gym facilities available to VCCA residents. In the evenings at VCCA there are frequently readings, presentations, open studios, or mini-concerts by residents which are announced after the clinking of a glass at dinner. These events are of course optional but I have generally enjoyed getting to learn more about the work of people I meet and connect with here. The gazebo is a popular evening destination for informal gatherings on warm nights. There is a library and tv room in the residence hall for folks that don't get too loud after quiet hours. My favorite at dusk activity this summer was floating around silently in the pool and watching the bats dip down to the surface of the water to drink right in front of me. My fifteen days at the VCCA were very productive and calming. I started four new egg tempera paintings and I made very significant progress on three of them. I met lovely new friends including fellow painter of women, Mira Gerard, who lives three hours from me in Johnson City, TN. http://www.miragerard.com . Most importantly I was able to get my state of mind back into the creative spirit after feeling low for the past couple months. I'm so grateful for everything the VCCA staff does to support and wrangle us creatives so that things run so smoothly and we can have the privilege of working in this beautiful place. If you are a visual artist, writer, or composer who would like to apply to this residency or if you would like to support the VCCA with a donation visit their website http://vcca.com . The Taubman Museum of Art held their annual Monster Art Rally on April 20, 2017 and I participated again this year. This event is a fundraiser for the educational programming of the museum. Artist volunteers from the community draw in front of a live audience for a two hour session and their drawings are briefly hung for viewing and then sold for a flat rate to the collector who picks the highest card from a deck at the end of the event. For this event I enjoy drawing something fun that I wouldn't normally work on. This year I drew Courtney Love Wolf. Here is my drawing area with my favorite pencils, a swag bag, and some lovely wine. I hope the winning collector enjoys her! My exhibition "Offerings" opened at Chroma Projects in Charlottesville, Virginia on April 7 and will run until April 29, 2017. This exhibition features egg tempera paintings and an installation piece which examine the relationship between the feminine and nature, rituals, and the aging mother earth depicted as a mystical crone. Sanctuary for the Crone is an installation project I created as part of "Offerings." It is a space veiled by silk organza exclusively for the older woman who is invited to enter, sit at a desk, and write a piece of her wisdom into one provided journals. On April 15th Chroma Projects hosted myself and Beatrix Ost for a salon style conversation with the community on recognizing the gifts of grace, insight, and cultivation in creative aging women. Beatrix Ost, Deborah McLeod owner of Chroma Projects, Susan Jamison. Chroma Projects is located at 112 West Main Street inside York Place on the downtown mall in Charlottesville, Virginia. Regular hours are generally Wednesday through Saturday, 1pm to 5pm or by appointment. Here is a interview I did for Huffington Post back in February to discuss my work and let people know about a talk I gave at Focus Gallery in Scottsville, Virginia. What is your creative process? Do you rely on the Muses, or routine, or some combination of both? Sometimes, if I get struck with inspiration, I just have to create right then and there, no matter the time, no matter the place. Sometimes you have to manufacture inspiration. How do you see it? I rely on the Muses, as in the visions that appear in my mind, but I also rely very heavily on my routine and my studio practice. I work both in my studio which is separate from my home and my large dining room table in my living space. It’s important for me to be in one of my art making places in order to focus on my work. The physical work of painting is relatively sedentary and tedious for me. It hurts my back and strains my eyes but it is strangely satisfying. The idea that an artist is suddenly struck with inspiration then just sits around happily painting while sipping Cabernet is a lovely fantasy. The job of an artist is really involved with looking, reading, thinking, editing, making, writing, and communicating. I do most of these things every day. My exhibition "Super Natural" opened September 23rd at Longwood Center for the Visual Arts, Longwood University in Farmville, VA and will run until January 8, 2017. The exhibition features a site specific installation piece titled "Feathers and Weights" along with egg tempera paintings dating from 2007 to 2016. Paintings on view include works loaned from private collections, "Trust in Me", "Lovelace", "Repair Me", and recently created available works, "Power Bear", and five selections from my spiderweb series. Power Bear, egg tempera on panel, 48"x36"
A catalog with images from the exhibition and essays about my work by Pam Grossman of http://www.phantasmaphile.com and Amy Moorefield, Director of Exhibitions at the Taubman Museum of Art will be available. I will be teaching a master class in egg tempera for students at Longwood University in November. My solo exhibition, "Enchantment" is on view in the Ruth C. Horton Gallery at the Moss Arts Center, Virginia Tech from September 1 - October 8, 2016. This exhibition includes eleven egg tempera paintings dating from 2008-2016 that depict dreamlike visions of my florid female archetypes alongside her animal familiars. It was curated by Meggin Hicklin, Exhibition Program Manger at the Moss Arts Center. The exhibition includes a special area in the back of the gallery with reference materials, books about artists and subjects that inspire me, photographs of my studio, and topics for discussion. Available in the gallery is a brochure with images of some works in the exhibition and an essay by Meggin Hicklin. “Suture Me Bat” depicts a big brown bat (Eptesicus fuscus) tethered to a woman's finger by a red thread which is sutured into her flesh symbolizing our connection to these fascinating and helpful creatures. These frequently misunderstood animals are not creepy or sinister. In fact, they help mankind by consuming over 1000 potentially disease carrying misquotes per hour as well as pests that eat farm crops. Bats are mammals which nurse their young which means they have much more in common with primates than rodents. The homepage of my freshly revamped website. I’m writing this in the hopes that others may benefit from my experiences as a less than tech savvy person who needs a website. If you are an artist, you need a website. It is your portfolio in online form. Unless you have unlimited financial resources to pay a responsive, professional web designer to make your site for you and kept it updated for years, I recommend taking a few days and learning to do it yourself. If you are a hip young web wizard, this article is not for you, and please don’t laugh too hard, just send this link to your mom. In the mid 2000’s I had someone build a webiste for me in trade for my artwork. At first this arrangement was satisfactory but then it seemed like more and more of my work was exchanged for fewer and fewer hours of updating and the value of my contribution was forgotten. I was increasingly made to feel like I was imposing on this person’s time. Most of us who have tried these trade-sy situations know how this ends. In 2010 I realized that I needed to acquire some basic skills so I could do this work myself and I taught myself how to use the now defunct iWeb application that came installed on my MacBook Pro. Why didn’t I do this earlier?!! After having the freedom to easily make updates when I needed to, as many times as I needed to, I can say the two days it took me to learn iWeb to create my new site was time well spent. It was basic but clean and it served me well for years. Unfortunately, Apple discontinued my beloved iWeb years ago and did not replace it with another site building tool. I still have iWeb on my 6 year old laptop but it’s always in the back of my mind that my laptop, and with it my dear old friend iWeb, will perish at some point. Building my former site with iWeb. On April 21, 2015, Google made a significant change to their search algorithms: websites that were not mobile-optimized were penalized in their search-engine rankings. My old iWeb site was not mobile ready. Everyone including my mother is viewing my site on mobile devices. Increasingly I couldn’t do things I needed to do like paste in html code to create newsletter subscription forms, or add a page with a commerce component. It was time for me to find a new way to build and update my site. In my search for a new website building tool, I looked at the many beautiful websites of my artist friends, http://jihamoon.com, http://www.lori-field.com, http://carrieannbaade.com, http://www.studiobeerhorst.com, among others to see how artists I love and respect were presenting themselves online. I read articles about artist’s websites from trusted sources like this one from Creative Capital http://blog.creative-capital.org/2013/04/internet-for-artists-why-we-only-recommend-two-website-services/. I figured out that some templates are built with Flash and that this is not a good thing. I researched sites like squarespace.com, wordpress.org, wordpress.com, wix.com, and many more that have templates which make it easy for those of us that don’t know much about building sites from scratch. Each service offers different features at different price points. I personally chose Squarespace because they have attractive templates for portfolios and they offered an introduction to eCommerce at a low price point (see my “shop” page with it’s lonely one item!) Those of you with more web skills than me might find wordpress.org more to your liking because you actually own the template you select. It took me about a week to figure out how to use Squarespace templates, build my website, and then connect my squarespace domain to my own custom domain name susanjamison.com. At first I selected a template that gave me a look that was similar to my previous site that I had made with iWeb. Then I decided to go for something completely different instead with a very impacting and changing homepage which is what you see here. Because my domain is registered with a rather unpopular company, the most difficult part of this process for me was connecting my own domain name to my new site. I received tech support from my friend, WebQueen, Christina Owens Knapp of http://hellowyellow.com who got me pretty close. Then I turned to Jason with Squarespace support for help. I sent him screen shots to show him how far I had gotten and he sent me back my same visuals marked up with exactly what I needed to do. Boom, done! Most of you who have your sites registered through bigger providers like Go Daddy, Dotster, etc. will find detailed guides on the help page for this topic. During this process I received excellent support from Squarespace. My painting portfolio as it appears on my new site. No matter which service you choose, I have complete faith in your ability to conquer the task of building and updating your own website with one of the terrific services out there, even if you need to cheat and use one that provides templates like I did. I think you will find that it is a great benefit to you to be able to easily make updates to your site yourself. The very first day I posted a link to my newly revamped website on social media, someone contacted me and bought a drawing. This sale paid for the expense of my new site for the first year and it paid me for the time I spent making it. Don’t sell yourself short, you can do this too! My exhibition Farewell, at the William King Museum of Art in Abingdon, Virginia continues through July until August 1st, 2015. Farewell features my textile based and sculptural works that are in remembrance of people who are lost, or are reminiscent of historical artifacts alongside drawings and watercolors that relate to the sea. Anchors and teardrop shaped lead weights are repeated symbols in this work. These anchors call to mind what can hold us securely in place in life or what can overwhelm and pull us under and the delicate balance between those two conditions. My body of textile based work began with “Drowning Dress”, a memorial to Virginia Woolf, the feminist writer, who drowned herself in the River Ouse by placing rocks in the pockets of her heavy coat. My dress is made of sheer white silk embroidered with the word “farewell” in red around the collar. Sewn onto the dress are approximately 200 teardrop shaped lead fishing weights. This piece is mounted directly on the wall along with several textile based works and veil forms. These veil works are made of lace, teardrop shaped beads, and horsehair. These forms and materials are closely related to Victorian mourning culture and rituals, which are a continued subject of interest that I draw from. Works on paper done in graphite with accents of watercolor feature horses swimming through the blue sea. These pieces echo the theme of Farewell, using symbols of weights and anchors. I love the improbable image of a cumbersome beast moving through the water. The sea is a metaphor for the unseen world beyond our senses and for a passage from this world to the next. The uncontrollable power of the sea makes one acutely aware of the frailty of life in comparison. It can be viewed as physical, symbolic, and spiritual. It is timeless in quality and acts as a bridge between past and present. Seawater is said to be closely related to our blood and our tears. Maker of artworks, flower hunter, bear whisperer, mountain dweller, fascinatrix.